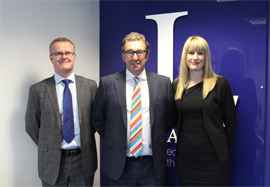 Two newly-promoted Area Sales Managers in the Midlands have predicted the region is set for a period of growth, both in terms of activity and house prices. Kayleigh Perry and Paul Cookson, who have taken up the roles at estate agents Leaders, believe the second half of 2017 will be a buoyant time for the local property scene. Kevin Shaw, National Sales Director at Leaders, says: “Kayleigh and Paul will oversee a total of 13 branches across the Midlands and are looking forward to the challenge of helping sellers get the best price for their homes and achieve a quick sale as well as supporting buyers as they look to find and secure their dream property. “Paul and Kayleigh boast a combined 35 years’ experience in the property industry. It is incredibly exciting to be able to promote two of our high performers from within the company. Paul, Area Sales Manager for the South Midlands and Worcestershire, says: “I cannot wait to get started and to drive the business forward. I have previously run a number of estate agents in the area and I am looking forward to using that experience to train and nurture the passionate and knowledgeable staff in our local network. “Prices are continuing to rise despite Brexit uncertainty. We are seeing more people moving home this summer and I expect this to continue through the remainder of 2017. Kayleigh, Area Sales Manager for the East Midlands, explains: “I am delighted to continue to help our branches in the Midlands grow and build an even stronger reputation, capitalising on a busy market. “The most important thing for me is that our customers walk away from their moving experience happy that they’ve achieved their aims thanks to the work of a team that genuinely cares about them. Paul and Kayleigh will oversee branches in locations including Leamington Spa, Birmingham, Derby, Nottingham, Worcester, Loughborough, Kenilworth, Mansfield, Droitwich and Redditch. For more information on selling a property anywhere in the Midlands contact your local Leaders branch or visit leaders.co.uk..